Why should you apply for a TnD Membership Card? Get additional 5% off on all your purchases! Includes unlimited 5% off on purchases for 1 year! At trendsndeals.com, not only do you get a free item for every purchase you make, you also get a chance to win amazing prizes just by joining our cool contests. 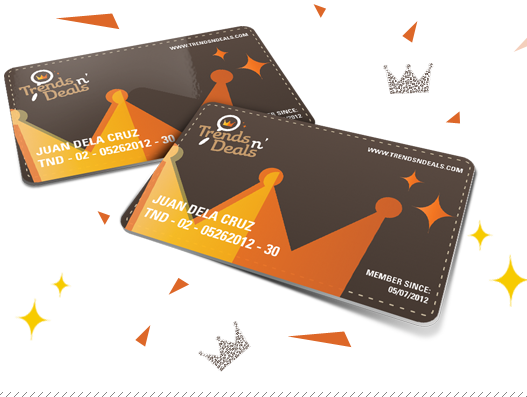 But we would like to make your shopping an even more rewarding and awesome experience by offering you our Trends N' Deals Membership Card! It is totally free to register at our website and start making purchases, and for just ₱499.00, you can get a Trends N' Deals Membership Card which will entitle you to an additional 5% off on ALL purchases in UNLIMITED quantities, valid for one year! So what are you waiting for? Go get one and get additional savings on top of the savings you get in all of our deals! Awesome!